European Union foreign ministers meeting in Luxembourg have adopted new economic sanctions against Iran and Syria and maintained existing measures against Belarus. The measures against Tehran are being imposed over its refusal to halt work on its nuclear program, which Western nations fear could be directed toward building a nuclear weapon. 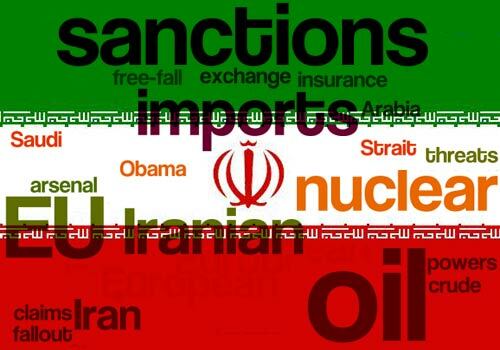 The sanctions against Iran include 34 entities and one individual added to the visa ban and asset freeze list. There is also a ban on gas imports and financial transactions, with the exception of those involving humanitarian aid, food, and medicine purchases. EU companies are forbidden to provide shipbuilding technology, oil storage capabilities, and classification services to Iranian tankers, as well as selling metals and graphites. EU foreign policy and security chief Catherine Ashton, who is also the chief negotiator of the Western powers in nuclear talks with Iran, said there is still hope for negotiations. "We are looking today at the additional measures that we will discuss during the course of the meeting," she said. "But I continue, as you know, to make every effort to explore the potential for Iran to make the decision in an entirely peaceful, civil, nuclear program." Ashton, however, added that the EU "will continue to keep up the pressure" on Tehran. German Foreign Minister Guido Westerwelle said fresh sanctions against Tehran were necessary since talks had yielded little progress. "Regrettably, it is necessary to increase sanctions on Iran," he said. "Talks have not made the substantial progress that would be sufficient. Of course, civil use of nuclear energy is Iran's right, as it is Iran's duty to abandon any kind of nuclear arms. This must be made sure. Since talks have not made sufficient substantial progress, and we continue to offer talks, we will need to increase sanctions." The foreign ministers also kept sanctions on Belarus but continued to hold out the prospect of lifting them if Minsk improves its rights practices. The EU again called on the Belarusian government to "stop harassment of civil society, the political opposition, and the independent media." The ministers said sanctions already imposed on Belarus could not be lifted now for several reasons, among them "not all political prisoners have been released and no released prisoner has been rehabilitated." The EU currently has imposed punitive measures on 243 people and 32 entities in Belarus and decided on October 15 to extend those measures until October 2013, but ministers noted the EU policy on restrictive measures against Belarus "remains open and under constant review." The ministers also imposed fresh measures against the Syrian regime, including an assets freeze and travel ban on 28 Syrian individuals and two firms. This is the 19th round of EU sanctions against the regime in Damascus since the Syrian conflict began in March 2011. It brings to 181 the number of people and to 54 the number of companies blacklisted by the EU. The measures target individuals linked to violence against protesters and companies involved in supplying equipment used for repression by the regime.